The events can be currently viewed in three different ways: The month view is the classic display of all events in a month grouped by days. The week view shows all events of a week, separated by days and timeframes. The events list contains all events of the next 30 days and lists them in a tabular view one below the other. Where an event is displayed is dependent from the start of the event. The timezone setting will be taken into account as well. Only all-day events are independent from the timezone (a full-day event in New Zealand at the 17th of July is also in France on the 17th of July). In the submenu you can navigate to the last and the next month. Each month contains the events of the respective days. Days from the previous or following month are displayed semi-transparent. The events will be highlighted with the colour of the calendar. Beneath the month view you can easily browse to a specific date. This date will be highlighted in the month view. Furthermore you can find a "Today" button that brings you back to the current date. Please note that the chosen date will be saved throughout your current session! If you browse through your events back in 2002 for example, then go to other areas of this site and come back later to the calendar you will see the events of 2002. If you want to add new events you need to make sure that you have at least one calendar enabled where you can add events in. In this case you will find a button beneath the month view. By the way: You can easily add events by double-clicking on the desired day! This day will be preselected in the form. 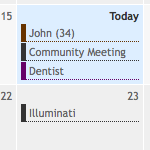 Below the three event views you can find the calendar legend. It shows you all enabled calendars and displays them in the selected colours. You can hide events from specific calendars by clicking on them or the checkbox. It helps to get a faster overview which event belongs to which calendar if you have many events. You can also find the direct link to the calendar management where you can add or enable calendars. The week view is similar to the month view, but only the seven days of the selected week will be shown. In contrast to the month view the events are separated into different timeframes. All-day events are in the first line, everything else will follow in the rows below. Beneath the event the start and end time can be found. The events list contains all events one below the other sorted by date. The list contains more information than the month and week view. You can see who is the creator of the event and where it takes place if a location has been specified. Beneath the list you can change the time period you want to show events from. The calendar legend can be found here as well. If you have many events a day it might be useful to group events by day - this way you can get a faster overview which event is today or tomorrow. This setting can be found within your user settings in settings » display » calendar.